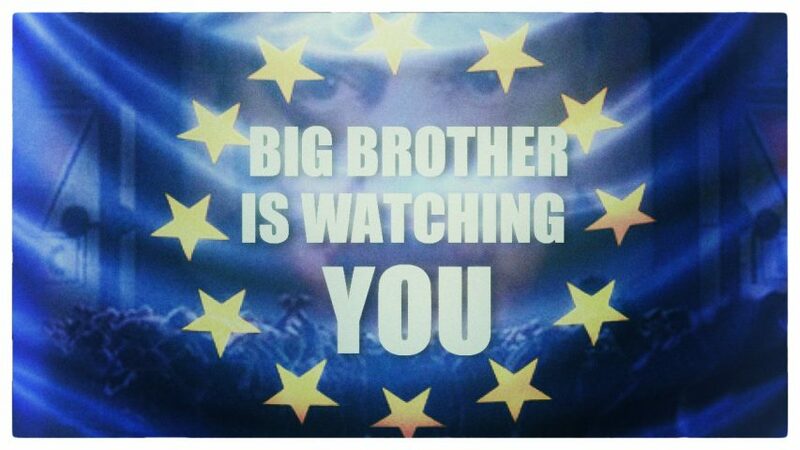 June 2010 – Brussels EU officials recently announced that they want to limit the demands European citizens can make in petitions by bringing in tougher rules on the amount of personal data required to be given by people signing them. Under the plans, citizens’ proposals that go “against the values of the union” – which, let’s not forget, are actually determined by the Brussels EU itself – will not be accepted. As such, by setting burdensome rules such as each signatory of a petition being required to provide a wide variety of personal data – including name, street address, email address, date and place of birth, nationality and personal identification numbers (passport; ID card; and social security) – it can be seen that the real intention of the Brussels EU in making this announcement is to set severe limits on the ability of European citizens to exert their democratic will. This is further proven by the fact that all petitions are to be subjected to an admissibility check once they reach a total of 300,000 signatures, with officials being given powers to stop any petition they decide does not meet the requirements. 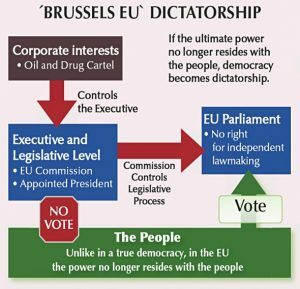 Lest anybody still be in any doubts as to the Brussels EU’s intention to replace democracy with dictatorship, let’s examine the truth behind some of its claims. THE FACTS: Operating outside the basic principles of freedom and democracy, the Brussels EU – by definition – is a dictatorship. The power of the people to determine their government has been transferred to corporate interests. Far from ensuring peace and prosperity for the inhabitants of Europe, the corporate interests behind the Brussels EU have previously been the economic driving forces behind two world wars. 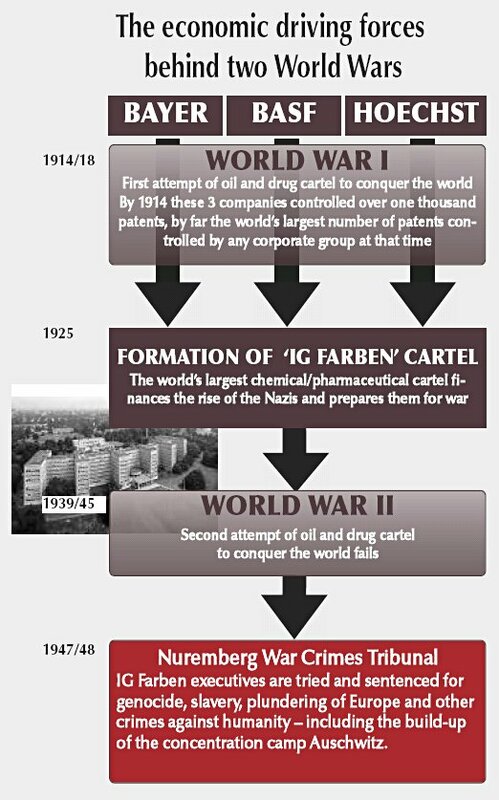 Following the failure of WWI and WWII to achieve world conquest for the interests behind the cartel, the Brussels EU project has become the bridgehead for their next attempt to conquer and control Europe – and from there the rest of the world. 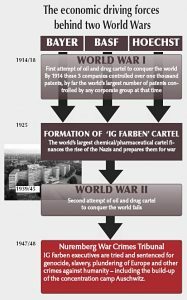 The strategic goal of the financial groups behind the oil and drug cartel is to control giant global markets that affect literally every human life. 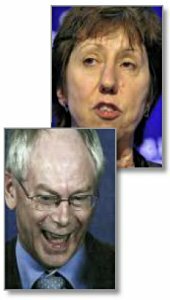 The Lisbon Treaty created the posts of EU President (to which Herman van Rompuy was appointed without any public vote) and EU Foreign Minister (to which Catherine Ashton was appointed without any public vote). The Brussels EU claims that the Lisbon Treaty does not alter the basic nature of Europe. THE FACTS: Article 1 of the Lisbon Treaty states that “The Union shall replace and succeed the European Community”. In addition to this, article 47 states that “The Union shall have legal personality.” Thus, it is absolutely clear that the post-Lisbon Union is a totally new constitutional and legal entity and that the European Community, of which the 27 member states were previously members, has ceased to exist. In addition, articles 207, 216, 217 and 218 of the treaty make it clear that the Brussels EU can now sign treaties with other countries or international organizations, on behalf of its member states, in all areas of its competence. And of course, let us not forget that the Treaty also created the posts of EU President (to which Herman van Rompuy was appointed without any public vote); EU Foreign Minister (to which Catherine Ashton was appointed without any public vote); and an EU diplomatic corps. In reality, therefore, it can be seen that “the basic nature” of Europe has actually been substantially altered. The Brussels EU claims that the Lisbon Treaty facilitates increased democratic control from national parliaments. THE FACTS: To all intents and purposes, Article 7 of the treaty’s Protocol on the Application of the Principles of Subsidiarity and Proportionality only gives national parliaments the power to complain about things they disagree with. In effect, it merely provides a mechanism whereby an objection can be raised if a complaint is supported by one third of all national parliaments. However, the Brussels EU is under no obligation to change or cancel any of its actions and can simply choose to override such a complaint if it wishes to do so. Moreover, should even the majority of national parliaments raise an objection to a legislative proposal brought by the European Commission, there is still no obligation for the Commission to change or cancel any of its actions. In such a situation, it can simply choose to override the complaint and refer it to be resolved by the European Council and the European parliament. As such, rather than increasing democratic control from national parliaments, it can be seen that, in practice, the bureaucratic nature of the hoops to be jumped through makes it extremely unlikely that the dictatorial nature of the Brussels EU can be restrained via these mechanisms. The 27 members of the EU Commission, the EU’s executive body, are all appointed without any public election taking place to select them. 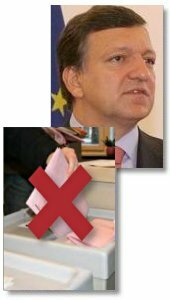 Even the Commission’s president, José Manuel Barroso, above, took his post without European voters having any say in his appointment whatsoever. The Brussels EU claims that the Lisbon Treaty makes its decision-making process more democratic. THE FACTS: Of all the Brussels EU’s deceptions, this statement is arguably one of the most disingenuous of all. For one thing, unlike in a true democracy, the European parliament remains unable to freely initiate and enact legislation in all areas of its choosing and of its own accord. For another, and as described above, the Lisbon Treaty created the posts of EU President and EU Foreign Minister and mandated that both were to be appointed without any public vote. And in addition, of course, the 27 members of the EU Commission, the EU’s executive body, will continue to be appointed without any public vote. To make matters worse, article 48 of the treaty makes clear that it is self-amending, in that in future it may be amended without having to hold an Intergovernmental Conference or consult citizens via referendums. 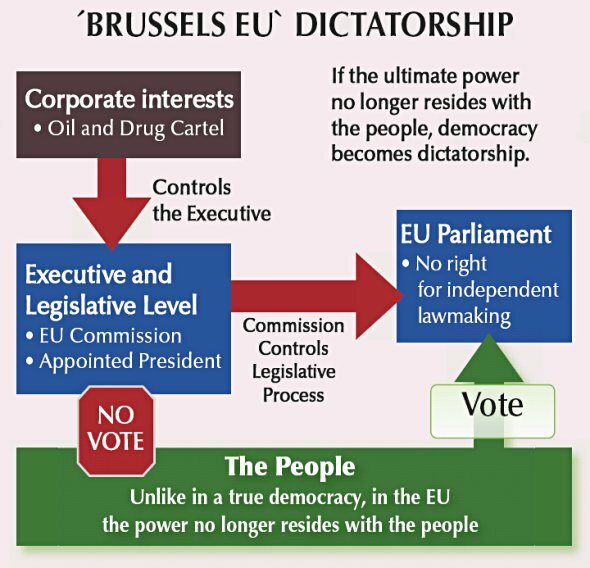 Bearing these facts in mind, it can be seen that, far from being “democratic”, the executive decision-making machinery of the Brussels EU is essentially that of an unelected dictatorship. The Brussels EU claims that the Lisbon Treaty responds to concerns raised by European citizens and will increase legitimacy in its functioning. THE FACTS: Given that concerned citizens in France and the Netherlands comprehensively rejected the so-called “European Constitution” in national referendums in 2005, the fact that 96 percent of the text of the Lisbon Treaty is identical to that of the Constitution, and that over 99 percent of European voters were not given any chance to vote on it, makes it absurd for the EU to make these claims. 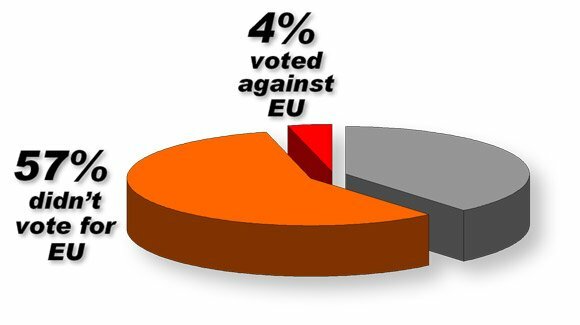 Furthermore, it should not be forgotten that 57 percent of the people of Europe who were eligible to vote in the EU elections in June 2009 protested against the Brussels EU by deliberately abstaining, whilst a further 4 percent of the eligible electorate cast deliberate votes against the EU dictatorship by voting for parties that are anti-EU and/or opposed to the Lisbon Treaty. As such, any notion that the Lisbon Treaty addresses the concerns of these people is delusional, to say the least. The Brussels EU claims that the Lisbon Treaty does not create a European army. The common security and defence policy shall be an integral part of the common foreign and security policy. It shall provide the Union with an operational capacity drawing on civilian and military assets. 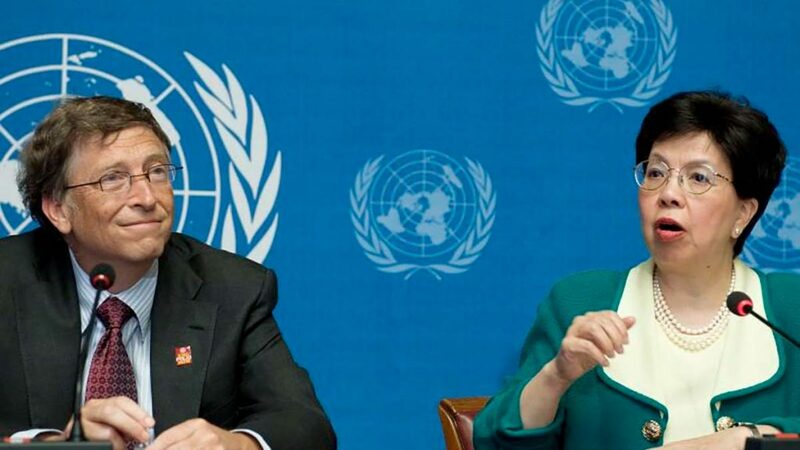 The Union may use them on missions outside the Union for peace-keeping, conflict prevention and strengthening international security in accordance with the principles of the United Nations Charter. The performance of these tasks shall be undertaken using capabilities provided by the Member States. Member States shall make civilian and military capabilities available to the Union for the implementation of the common security and defence policy. This clause also further militarizes the EU by stating that “Member States shall undertake progressively to improve their military capabilities” and making clear that the European Defence Agency will be incorporated into the amended treaties. Article 42.6 of the treaty states the following: Those Member States whose military capabilities fulfil higher criteria and which have made more binding commitments to one another in this area with a view to the most demanding missions shall establish permanent structured cooperation within the Union framework. Article 43.1 of the treaty states the following: The tasks referred to in Article 42(1), in the course of which the Union may use civilian and military means, shall include joint disarmament operations, humanitarian and rescue tasks, military advice and assistance tasks, conflict prevention and peace-keeping tasks, tasks of combat forces in crisis management, including peace-making and post-conflict stabilisation. france24.com, February 6, 2010 (AFP) Germany supports the creation of a European army in the long term so that the EU can be a “global player,” Foreign Minister Guido Westerwelle told the Munich Security Conference on Saturday. “The long-term goal is the establishment of a European army under full parliamentary control. “The concept of a European army was set out in the 27-nation EU’s reforming Lisbon Treaty,” he said. 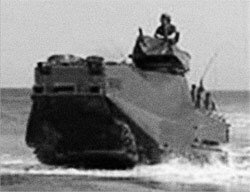 A confidential five-page document, detailing France’s enthusiasm for common EU funding of military operations, has been circulated to European governments, it was reported last night. The proposals were supported by a speech made by President Sarkozy last night in Athens, in which he emphasised his desire to push forward his plans for military integration in Europe. These include the establishment of a permanent operational headquarters in Brussels and development exchange training for officers.